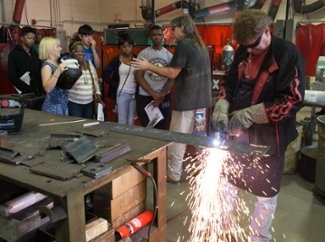 The challenge is educating youth and their parents about the high pay that comes with the 1,500 manufacturing jobs in Southwestern Illinois in the next five years, and connecting them to the right resources to ensure their success, according to Southern Illinois University Edwardsville East St. Louis Center Executive Director Jesse Dixon. The Center partnered with the Mid America Workforce Investment Board (MAWIB), Leadership Council Southwestern Illinois, Southern Illinois Construction Advancement Program (SICAP) Southern Illinois Builders Association (SIBA) and Scott Air Force Base 375th Communications Group to provide a morning of various interactive events including reading about construction careers to SIUE Head Start/Early Head Start children and engaging SIUE Project Success and Upward Bound students with informational booths and classroom discussions about manufacturing. The morning ended with an on-site viewing of an Ameren utility truck and St. Clair County utility trucks. “Manufacturing jobs in Madison and St. Clair counties offer average earnings that top $80,000 a year, which is well above the national average,” said Don Vichitvongsa, general manager of SunCoke Energy in Granite City. “Careers in the trades also come with a high wage, averaging almost $33 per hour plus benefits of $22 per hour for a total of $55 an hour. The Manufacturing/Craft Day Experience was an opportunity to present young people with a different “menu of career options,” said Col. Terrence Adams, commander of the 375th Communications Group at Scott Air Force Base. “A lot of kids don’t know what’s on the menu as it relates to jobs,” said Adams, an Upward Bound alumnus from Tuskegee University. “We are providing them with information that they may not normally know about and let them pick careers according to their appetites. Listening to information about jobs in welding are (left to right): Allen Williams, Liz Happold (of Leadership Council Southwestern Illinois), Serenity Wallace-Herron, Julio Vallejo, Dionna Samuel, William Foster and Gary Eversmann (instructor). 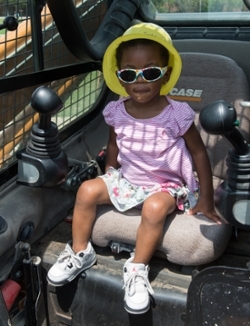 SIUE Head Start/Early Head Start student Kyliee Lumpford.